As God said to me “You will reach Millions and Millions of people in the Earth, and tell about me”, here through this webpage I am happy to meet you !!.. Rejoice in the Lord, that God had remembered YOU on saying this….May God Bless You !!! CAROLINE was leading a normal worldly life, without involvement into any Christian Spiritual activities. She is a Software Engineer, who has worked abroad and later became a Business woman. She resides with her husband, and a son in Coimbatore, Tamil Nadu, South India. Visitation of Heaven for Caroline took place on December 21st 2008 where she met Our Lord Almighty. This wonderful experience has changed her life and made her as a noted evangelist now. In 2009 Caroline's life took on an entirely new meaning when she surrendered her heart and life to Jesus Christ. God named her ministry as “Mirabella" which means "Miracles". There is much more to the story of this lady and her Ministry, now impacting with the lifesaving and Miracle-working Message of Jesus Christ. 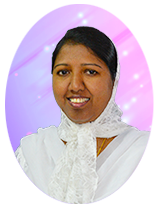 During recent years, she has been welcome abroad and many cities in India yet her message of the Evangelizing of Jesus Christ continues to be fervent, motivating her to “Go out to the whole world, proclaim the Gospel to all creation” (Mark 16:15). As you come to know Mirabella, You also become a part of Mirabella Ministry, because God has chosen You also one among those Millions of people. Heavenly Visitation for Caroline happened in 2008 December 21. She met The Father and returned to the world to tell millions and millions of people that He is the only God and Jesus is our redeemer.